On the 8th of March 2011, clarion call took me to Akwa Ibom shortly after I graduated from the University. As soon as I received my posting letter and I saw Akwa ibom, I knew I was in for food adventure. Indeed, my expectation was met during my one year compulsory sojourn. This is how my romance with the soup started; now I can talk and even give people Afang Soup recipe as I picked it from Akwa Ibom. The night I arrived the beautiful city of Uyo the capital of Akwa Ibom, I was completely exhausted and hungry….So, I had to visit the restaurant. My first meal was Afang soup plus Garri (Eba). I had not tasted the soup before and I decided to give it a shot since it had always being talked about as a super soup by many who have been opportune to have a bite. As it was served, not only did the soup look so attractive, it also smelled great. With enthusiasm, I took the first bolus of Eba with the soup. It took me by surprise. Delicious was an understatement. As a young man who had lived his entire life majorly in Yorubaland, none of their soups taste this great. As stay with the indigenes during my service year, I did learn the nitty-gritty of how the soup is prepared to taste the Akwa Ibom way. Follow the recipe and all included below and your highly nutritious Afang soup is ready. Small amount of beef (optional), dry fish, 250g of kpomo (Cow skin), Onions (1-2 bulbs depending on size) and periwinkle. Finally, Water leaves and Afang leaves as appropriate. Step 1: Wash properly the goat meat, beef, kpomo, snail (with lime or potash), stock fish ( in salty hot water for few minutes). Keep the goat meat, beef, kpomo and snail meat in a cooking pot after they had been washed properly. Step 2: Wash, drain and slice the Water leaves and Afang leaves. The sliced Afang leafs has to be grinded. Step 3: In a separate bowl, wash and dice onions and some pepper. Important Note: Do not forget to properly wash your hands before handling the food items. The following steps will guide you in preparing the Afang soup the way people of Akwa Ibom state prepare it. Place the washed meats in step 1 above on low heat and cook until the meats are tender. Do not forget to add adequate amount of water, diced onions, pepper and salt. After the meats are tender, add the washed stock fish and cook for about a minutes or two. Ensure you have enough stock water. Add palm oil and allow to boil for two minutes. Add other ingredients like Maggi (seasoning), crayfish and periwinkle and allow to boil before adding the Afang leaves. Taste the soup to know if there is need to add more salts. Allow to cook for about 3 minutes. Ensure the leaves still possess the greenness. Your Afang soup is ready to be served. Afang soup has medicinal purposes for sore throats, nausea and loss of appetite It is a rich source of vitamins with loaded essential and non- essential amino acids. It also has anti- inflammatory and anti-oxidant properties. Go ahead and go give it a try. What if you sliced the afang leaves instead of grinding. Will it still be delicious. Grinding and pounding seem to produce a better result. You could slice it, but I had never seen it done that way before. Thanks for the comment. U seem to av mixed d process. U kno waterleaf contains a lot of water nd afang soup is normally cooked with little or no water at all. 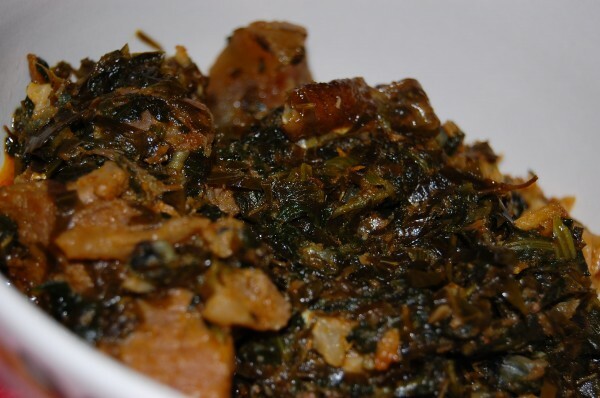 So if u 1st boil meat wit water so as to get some stock, u might end up having a watery pot of afang soup Step 1– Put d sliced waterleaf in a pot nd put to boil for some minutes until d whole leaf is really green nd soft. D meat nd others can follow, then d afang comes last snc u re nt going 2 cook it 2 long. Pls except u don’t eat periwinkle, d Akwa Ibom pple dnt cook afang soup without periwinkle. Please next time u go there, ask for EKPANG NKUKWO. Stay blessed. If d afang leaves are sliced, it stil make sense nd give d same delicious taste bt pounding is BEST. Slicing d leaves is Igbo method. Clearly, asides from good foods, Akwa Ibom is a great city. Hospitality is superb. Opportunities abound. As for accomodation, you place of primary assignment will provide you with one. I had a room and parlour self contain to my self in Oron. You do not need to redeploy. However, it all depends on your choice. This is great! Exactly the way I love to cook my Afang soup. The leaves must be ground with a mechanical blender or mortar so that it’s rich taste and flavour will seep into the soup. Slicing it isn’t enough to get the desired taste. When it is properly ground, IG becomes pasty and dissolves easily in the broth thereby thickening the soup. Great job, sir. How do I follow your blog? I want to get updates every time you post a recipe. Your writing style makes me want to try out the new recipes I just learnt- Ewedu soup and Kunun Zaki. Great job, sir. I just followed your blog? I want to get updates every time you post a recipe. Your writing style makes me want to try out the new recipes I just learnt- Ewedu soup and Kunun Zaki. @ini, nice to know you love the write up and my style of writing.You can like Foodsng page to get updates or type in your email address to get them via email. Also read how to make Oha soup https://www.foodsng.com/learn-how-to-make-oha-soup-recipe/#comments and share with your families and friends. Thank you very much for your kind words. You can subscribe to our updates for free here. Is there a particular leaf called ‘afang’ ? @Ibisomaltida, there is a leaf called Afang. It is common in the south south region of Nigeri especially in Calabar and Akwa Ibom. Loads of Afang leaves are also imported to Nigeria from Cameroon. Hello,I’m in port Harcourt presently,I used to tink okasi leaf Nd water leaf makes afang soup. Ar u saying this isn’t right? @Ade, Ukazi soup and Afang soup have similarities. In fact, ukazi is the eastern name for Afang leaf which is the name used by the Ibibios. 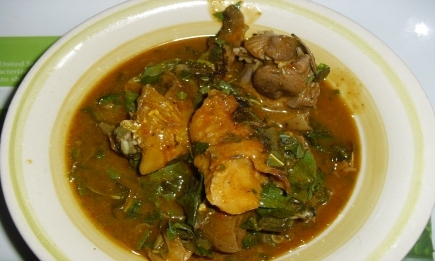 However, in cooking Ukazi soup, there is usually addition of thickner which is not used in Afang soup. D grinding is to soften d leaf making it edibles afang leaf is naturally hard d crushing mks it better and tasty. @Joe, I agree with you, I have seen many people crush it using mortar and pestle. what is the name for afang leavr in yoruba? thanks. lol….Afang is Afang. No yoruba name to the best of my knowledge. Please do I just put the water leaf inside the stock containing d meat and palm oil.bcos Thot waterleaf has water like some people fry it I palmoil before dey add they add there meat nd stock.please clear my confusion.Thanks. @ Amaka, Well I have not seen people fry it. The simple trick is to monitor the amount of stock after cooking your meat. You must ensure it is not too much. By the time you add other ingredients, water leaf and afang leaf, the soup must be thick. Just consider the facts that water leaf melts easily. That it why the leaves must be added at d last stage while not staying long on cooker to help preserve their nutrients. I relate with this post till the end. I was in Uyo, Akwaibom state to cover the presidential election. Akwaibomites are a rare breed. As a visitor, they will spoil you with all sorts of soups and meals. I discovered the soup they call fisherman soup. That is heaven on earth. The city of Uyo is beautiful with good road network, airport and le meridiem hotel. I can’t wait to visit again. Dear corper go and be blessed! You will be glad you did! Uyo may be really good but Benue has won ny heart just through service year also. The meats fruits yams tomatoes carrots wow! Pear and garden eggs are all over the place in good sizes and good shapes! I saw okro so big and healthy. Its inexplicable. The pepper is fresh and the sizes will amaze anyone who has lived in places like Ibadan and Lagos. The south west is baaaad when you talk about food crops in their narkets. Benue is indeed the food basket of this nation Nigeria. This is really the ibibio way of cooking afang. The efiks don’t add onions n periwinkle to their afang. Pounding afang is far better than even grinding, it brings out the flavour. Solo please you don’t cook the water leaf b4 the afang. Thats why it is advised you use very little water to steam the meat. The water from the water leaf is what they use to cook the soup.